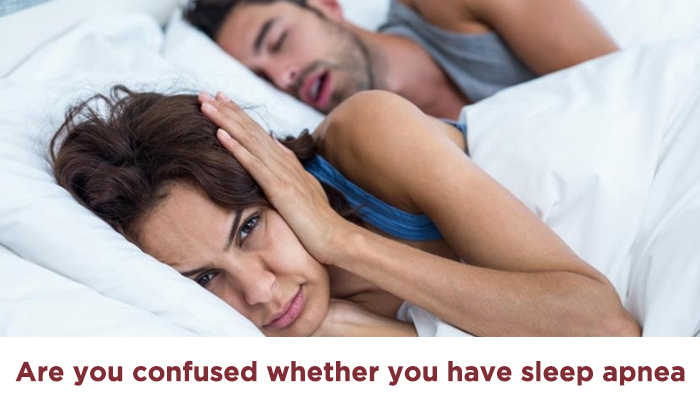 Are you confused whether you have sleep apnea? Read this! Sleep apnea is a disorder where the person unknowingly stops breathing several times during their night’s sleep. This results in insufficient oxygen delivery to the brain and the body. As a result, the person wakes up tired the next morning. If this is your case, then you might want to check with your Sleep Apnea dentist at the earliest. This blog will give you an idea of what sleep apnea is, what are the causes and its symptoms. Obstructive Sleep Apnea – This happens when the throat muscles relax. Central Sleep Apnea – This occurs when the brain doesn’t send a signal to the body and the muscles that control breathing. Complex Sleep Apnea – This is a condition when the person experiences both Central and Obstructive sleep apnea. If a person experiences a Complex Sleep Apnea, they should immediately see their sleep apnea doctor. Obstructive sleep apnea and Central sleep apnea have more or less similar symptoms. This makes it difficult for an ordinary man to conclude on what the exact trouble is. Having dealt with a number of patients, it is easy for a sleep apnea dentist to find out the treatment you will need. Below is a list of symptoms that you have to be aware of if you suspect sleep apnea in you or your loved ones. Stopping to breathe during sleep and the other person reports it the next morning. Struggling to breathe in the middle of sleep. Waking up with the mouth dried. Over Sleepiness during the day. Trouble staying asleep during nights. Difficulty in concentrating even when awake. When should you get an appointment? Snoring, in general, is a potential problem and needs attention. We also need to be cautious because not every person who has sleep apnea snores. It is essential for us to know and note down what other symptoms we are experiencing so it will be easy when speaking to our doctor. The muscles in the back of the throat support the soft palate, the tongue, the side walls of the throat and the tongue and the Ulva. When these supporting muscles relax, the air passage closes or narrows down, as a result very less air is passed. When this happens very less oxygen is passed to the brain and the body. The brain wakes the person up so he or she can get some air and open the passage. The awakening is so short that the person often does not remember it happening. This is often repetitive and can happen anywhere from 30 to 50 times or even more, resulting in improper sleep all through the night. At times, the person might snort, gasp or choke yet not realize it till the person next to them tells it in the morning. This is a less common form of sleep apnea. It occurs when the brain does not send signals to the muscles involved in breathing. This condition results in breathlessness (shortness of breath), difficulty in sleeping, or staying asleep through the night. Anyone can be affected by sleep apnea. Children are no exemption. The risk factors of sleep apnea are as below. Obesity – Obese people are more vulnerable to sleep apnea than the other individuals. This is due to the fat deposits in the upper airway. Neck circumference – Some people with thicker necks have narrow air passage. This eventually results in breathing difficulty. Narrow air passage – Tonsils or adenoids can narrow down the air passage and make it difficult for you to breathe. This commonly happens in children. Men – Compared to women, men are more prone to sleep apnea. Women tend to gain weight and become more obese after menopause. This eventually leads to sleep apnea. Age – Age is one of the major risk factors as far as sleep apnea is concerned. Though people of all age groups are affected, elders are more likely to get it. Family history – You could be unguarded in you have a family history of sleep apnea. Smoking – People who smoke tend to get sleep apnea comparatively more than their non-smoking counterparts. The risk of fluid retention and swelling in the upper airway is more when you smoke. Use of sedatives – Tranquilizers, sedatives, and alcohol are meant to relax the muscles. These must not be consumed if you suspect sleep apnea. However, it is good to avoid these muscle relaxing substances so you can be safe from these sleep issues. Are you looking for a sleep apnea treatment anywhere around San Jose? Give us a call at (408) 216-8811 or you can just walk-in to our clinic located at 1569 Lexann Ave STE 228, San Jose, CA 95121. Author adminPosted on November 12, 2018 November 15, 2018 Leave a comment on Are you confused whether you have sleep apnea? Read this!